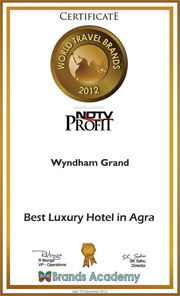 Wyndham Grand Agra provides Agra’s most unique large-scale conferencing and events facility. Natural light and stunning views make this a truly splendid venue in the city of Taj Mahal, making the hotel an extension of the Taj itself. Up to 5,000 people can be accommodated in Gulistan (banquet lawn) with a palacial look. The space is also flexible, with Senate divisible into two discrete spaces it leaves with more options. While other dinning spaces can also be used for both conference and function purposes. Beyond these we have private dinning spaces to give you a feel of cosiness and they can be termed as a selection of effortlessly elegant and luxurious entertaining spaces. Enjoy breath-taking views of the hotel and also the Taj Mahal from the roof top of the hotel.